Climbing on unusual and solid rock in a hidden, peaceful corner of Lyttelton. The wall has a NW aspect which is sunny all year and dries quickly. As there is no shelter, the crag can get very hot in summer afternoons . All routes have hangered bolts. Anchors are double chains or ring bolts. From the tunnel, turn left into Norwich Quay, then left up Oxford street (3rd on the left), right on Exeter then left into St David Street. 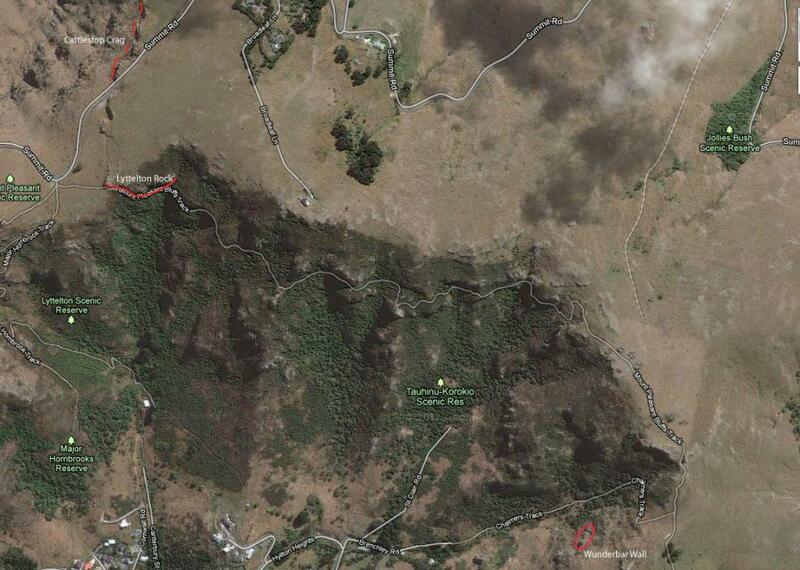 Continue straight up the hill into Brenchley Rd and drive to the very end before the first gate. Park clear of the Road and gate. Through the gate and follow the OLD 4wd track through another gate. Continue on the track between stone walls up the valley, the Chalmers track. Once past the crag, look for a warratah with a yellow marker on top on your right. Cut off the main track and climb gradually across to the left hand edge of the wall. The track and scrub around the base of the crag was freshly cut back on Jan 1st 2015. Awkwardly up a crack, passing the block on it’s left side, then angle right into the corner with a bush. Anchor rings. Up the wall and tricky cobbled bulge left of Skylark. Crux finish out left on the rounded arete. Good climbing but keep your feet on the wall and left of Skylark. Groove/crack beginning on right side of the slab behind the shrub. Directly up the cobble corner. Start in the corner 3m R. Up and traverse left to clip the bolt, Up to the ledge. Move left and boldly climb the R side of the block (left of the bolts).From the top of the block step rightand head directly up the face and over the top to chain anchors on good holds. Start as for Nettle. From the bottom of the right facing corner, swing up left and on to the ledge and then over right to the arête. Clip the last bolt and traverse right, over the arête onto the face to finish. Two metres R, a thin crack runs up left into a corner. Bridge on up staying in the corner to the fourth bolt and then step right. Finish directly above the bolt. Twin cracks. A vague crack past three bolts then slightly right and back left to the fourth bolt. Up to the flaring groove and then finish left to the Skylark anchor chains. An alternate finish is to swing right up onto the rounded rib and then up to the Jellied Squeals anchor chains. A metre right is an irregular crack leading up to a smooth scoop. Wrestle up into this scoop and exit left. Then head right to the anchor chains. From start of OUP climb up onto easy ledge at right on black rock. Follow shallow corner at left staying right of red rock to a steep finish up to anchor chains. From the same easy ledge as Seeing Red, climb straight up a vague crack on black rock to the anchor. From belay bolt 3m right of GB, climb the wee pinnacle left of the wide crack. Grab the top of the pinnacle and swing over right to bridge up the corner. Dble chain anchor. Head up the wall right of LB's first bolt and into the scoop. Climb up out of the scoop, to the left initially, and reach good holds and the dble chain anchors. Stay out of LB's gully. Along to the right past the black rock gully. The groove and crack on the left end of the next buttress. Double ring bolt anchor. From the single belayer's bolt, bridge up the left edge of the cave. Swing out right onto the block and continue up the wall right of the arête. An exciting finish on a small hold leads to jugs. Anchor to Double Ring bolts. From right edge of the overhanging section, climb left treating rock with care. Traverse under small bulge and climb straight up crack/groove past the seat. Nice moves at top. Anchor chains. Same start point as K3. Climb the right side of the rotten crack angling slightly left through the bulge. Climb up more easily and then angle right across the solid yellow rock to good holds. Anchor chains. This climb is on a small buttress right and above the main wall. From the base of the black crack, layback the arête until standing on it. Place the #4 friend and then move right onto face. Updated with new routes and new route photo.